Wellness In Motion runs a fully equipped day spa offering either a quick relax in and out visit to the more indulge full day spa. A self-service online spa booking is available for clients who run debit accounts with us. Please login to make your appointment should you be a current client running a debit account. If you are a new client who has already visited the spa please follow through the online registration process. Becoming a Wellness In Motion Spa client you will instantly start earning loyalty points!! Give a basic opt-in request to one of our staff or register online. Our spa utilises products such as Dermalogica, Guinot, Essie and OPI – only the best products and therapists in the business. Wellness In Motion is an exclusive, 5-star premier health club, offering an unrivalled service for a refined, innovative lifestyle experience. Wellness In Motion offers the top fitness technologies, holistic approach to wellness, rejuvenating spa service, personal training and somatology. 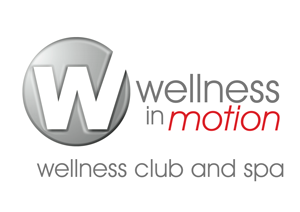 Being a lifestyle management company on top of a Gym and Spa facility, Wellness In Motion offers services to further your fitness and health regime. WIM goes that extra step to offer Bio kinetics, Diet and health assessments with our highly trained and qualified professionals: Bio kenetecist, Dietician and personal trainers.